like your all tutorial this is also awesome. Nice example, but is there any way to design service without UI and that service need to communicate with local DB or webservice, if any example please let me know. Hi I don't have any demo for save data into database using services. But if you need any thing like that same code will work for you. If you don't want this UI change with yours and start service onCreate() method of application and if you want you can stop it onDestroy() method. 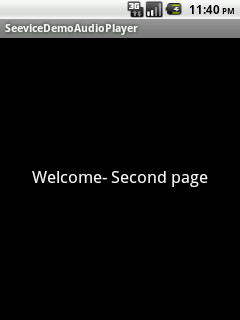 I have developed an application in android. Hi Mohit, As you can see above code for play music in background, that's mean this services is working so now just modify according your requirement. 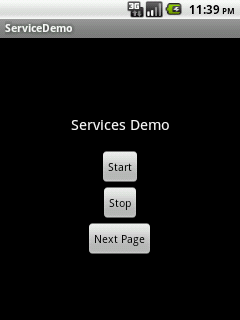 1)Write a method for getting data from server using web-services. 2)Write Broadcast-Receiver for update your UI with exciting data from server. 3)Call that method inside your services inside onCreate()method. Please do provide source codes. you can download zip code from above "Download Link " on my blog..
yes i saw your link it was quiet helpful but i got lot of doubht in that ,it seems like in broadcast receiver we are not allowed to do long process like updating the server for every 5 mins . So i guess it has to be done through service method from broadcast receiver .i,e broadcast receiver is fired for every 5 mins from alarm manager and once it get fired service method should be called from the receiver method . am i right Manish?? if im correct then how to call the service method from receiver method , Because i don't have any idea about the service method please help me desperately needed answer ..
No you are wrong Broadcast receiver is not doing anything here. You have to call your query inside doInBackground method or use Service. And Alarm manager will send data every after 5 min or what time you want. Broadcast is only used for any notification like getting wifi network revive any message etc. Well if you have any doubt I will suggest first read and understand things then only code.